Such is the level of consistency of Manchester City (nine straight wins) and Liverpool (five straight victories), that it can be easy to lose sight of just how good this title race is. Both teams are playing football which is technically brilliant and entertaining, masterfully organised by two of the game’s great managers — City’s Pep Guardiola and Liverpool’s Juergen Klopp. The drama is perhaps slightly reduced by the absence of upsets but the constant winning and the narrow two point gap between leaders Liverpool and defending champions City that the race is building up to an epic conclusion. Either the pair will defeat all the nerves and obstacles to win out the season — in which City will be champions — or one will stumble. The next 10 days will be crucial with City facing tough challenges against Tottenham Hotspur at home and then at Old Trafford in their derby against Manchester United. 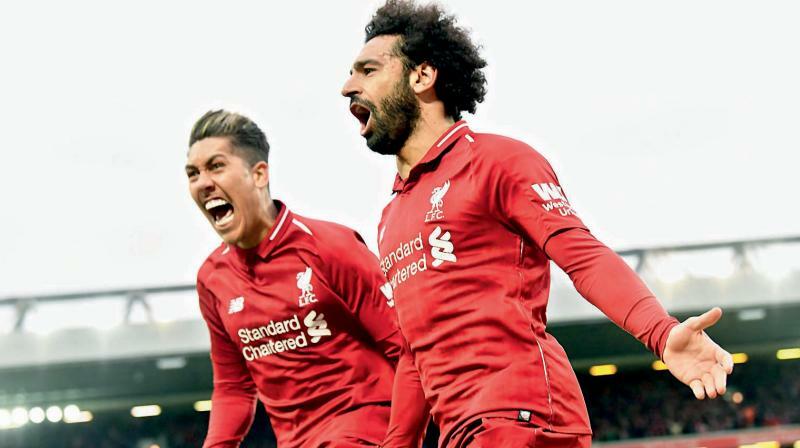 Add into the mix the stakes for both clubs — Liverpool without a domestic league title for 29 years and City searching for an unprecedented quadruple of honours — and this is a fusion of entertainment, drama and sporting excellence that has rarely been witnessed in the Premier League. Chelsea lost at Anfield on Sunday but Maurizio Sarri’s side certainly contributed to an excellent contest and none more so than Belgian wing wizard Eden Hazard. The expectation is that Hazard, who possesses one of the finest touches in the game allied with tremendous dribbling skills, will head to Real Madrid at the end of this season. Such is Chelsea’s dependence on his individual skills that Sarri, or whoever is in charge, will surely have to adjust the team’s approach if Hazard is no longer around. Some players simply cannot be replaced. After a run of four losses in five games in all competitions Manchester United manager Ole Gunnar Solskjaer was relieved to have, rather fortunately, picked up a win against West Ham United on Saturday. But the uninspiring performance was a reminder that for all the Norwegian’s impact since replacing Jose Mourinho, United need to make several major additions during the next transfer window if they are to start to compete with Manchester City and Liverpool for the honours. A central defender has long been viewed as a priority but United will surely be looking for a holding midfielder and a creative playmaker, as well as a right-back. There is already plenty of quality in attack but United need to develop a more effective style of play if they are to get the most out of Marcus Rashford, Anthony Martial and Romelu Lukaku. Burnley’s 2-0 win over Cardiff City virtually assured survival for Sean Dyche’s side, meaning the Clarets will enjoy a fourth straight season in the top flight for the first time in 48 years. At the half-way stage in this campaign, the Lancashire club had just 12 points, but 27 points from their following 15 outings, with Saturday’s victory their third win in a row, have pushed Dyche’s men out of trouble. A big part of the of credit should go to 19-year-old winger Dwight McNeil, who set up both goals against Cardiff and has added the missing ingredient of creativity since he was brought in after the 5-1 Boxing Day hammering at home to Everton. Having won just twice since the New Year in the Premier League, Brighton have been dragged into the scrap at the bottom and their 5-0 home loss to Bournemouth set off the alarm bells. Chris Hughton’s side now face a crunch match on Tuesday against Cardiff, who occupy 18th place, the final relegation slot and are five points behind Brighton. Where has it gone wrong? Take a look at the long list of players, a full team line-ups worth, signed by the club in the summer for a grand total of over 70 million pounds and ask yourself how many have lived up to expectations?